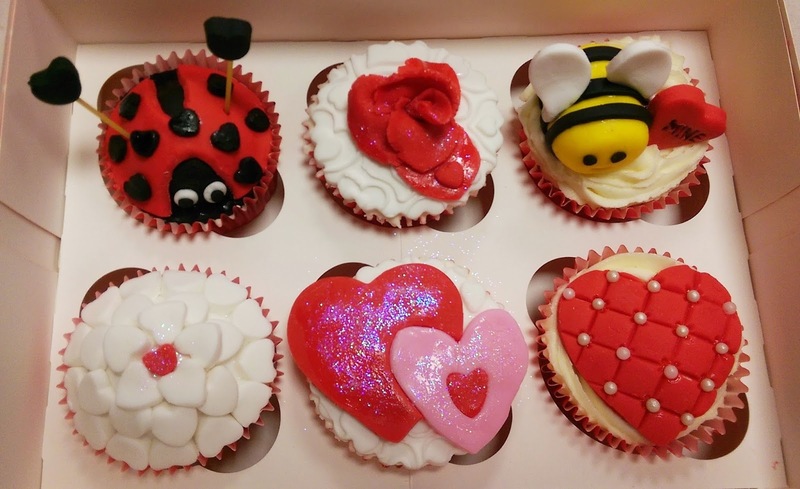 Last weekend I went to a Valentine’s cupcake decorating class at a cake and baking supply shop in Glasgow’s Southside. Just off of Cathcart Road, Bakey Cakey is run by Food Network presenter and cake decorator extraordinaire Nikki, and I spent two and a half hours there decorating cakes and playing with fondant icing. I wanted to share three of the six designs with you so that you can recreate them at home. To make this heart design you’ll need a cupcake with piped vanilla buttercream on it. 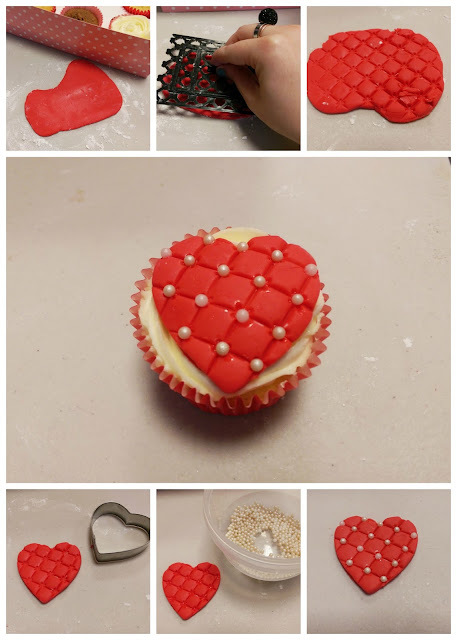 You then need to roll out a piece of red fondant icing and press a fondant icing stamp on top of it to create a pattern. Next, use a heart shaped cookie cutter roughly the same size as the cake to cut out the heart shape. Dab some edible glue into some of the indented areas and apply some pearl sugar ball decorations on top of the glue. You can use any pattern you like, but I love this cross-hatched one. 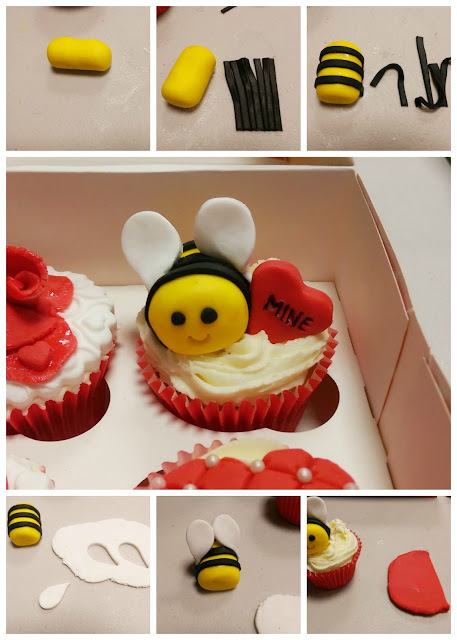 To make this adorable Bee Mine one, you’ll also need a cupcake iced with piped vanilla frosting. Roll out a piece of yellow fondant icing into the size and shape of the plastic inside of a Kinder Egg- this is the bee’s body. You then need to roll out some black fondant icing and cut it into thin strips. Stick these onto the yellow body with some edible glue. The next stage is to add wings to your bee with white fondant icing and use tiny balls of black and white fondant icing to make some eyes. Press in a little smile with a knife and he’s all set to go on top of the cake. Finally you need to cut out a heart with a fondant icing heart stamper and write ‘Mine’ on it with an edible black marker pen. I think this looks so cute! This very simple design looks really stunning. Pipe a dollop of vanilla buttercream onto the centre of a bare cupcake. You then need to roll out a thin piece of white fondant icing, cut a circle the size of your cake out with a cookie cutter and lay it over the buttercream. Press down the sides only to create a buttercream dome. Next, roll out some more white fondant icing, thicker than before, and cut out lots of little hearts with a small heart cutter. 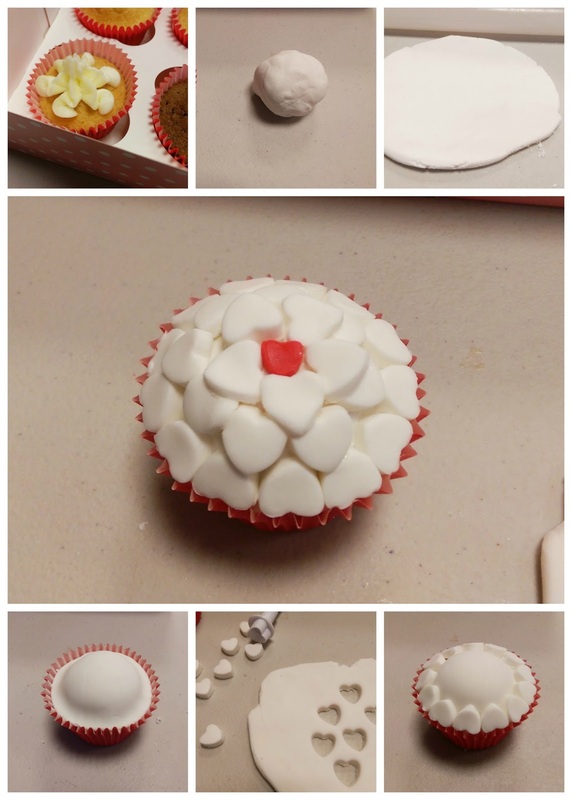 Use edible glue to glue these onto the dome and place a single red heart at the top in the centre.